The "Italian Stallion" rediscovers his roots in this exciting, thrill-packed drama that reunites Sylvester Stallone with the Oscar-winning director of the original Rocky. $14 million on -unknown- screens. You can’t go home again. That old adage is proved repeatedly throughout Rocky V, the one film in the series that tries harder than any of the others to recapture the magic that made the original Rocky so special. Unfortunately, it doesn’t succeed, as the fourth sequel comes across as little more than a flat attempt to duplicate the older movie’s charm. At least RV tried to regain some of the original’s simplicity and emphasis on character. Both of those elements had become increasingly rare during the prior two sequels. 1982’s Rocky III made the title character into nothing more than a muscle-bound robot. While 1985’s Rocky IV restored some life to Stallone’s pet creation, it presented a story that greatly resembled a 90-minute music video. Rocky himself seemed a little softer and more likeable than in RIII, but its barrage of rock-embellished montages left little room for character development. For 1990’s Rocky V, the emphasis really was on a “back to basics” approach, and to do so, the director of the original film returned. Stallone had led the first three sequels - starting with 1979’s Rocky II - but he ceded the reins to John G. Avildsen for the fifth - and so far final - adventure. However, Stallone retained his position as writer and star, so he didn’t give up all of his creative control. Perhaps it was time he let someone else have a crack at Rocky, as the fifth time wasn’t the charm. Nor was it charming, and the movie’s desperate attempts to come across as warm and loveable made it even less endearing. As with all of the sequels, RV begins immediately at the end of the prior film. After a brutal beating at the hands of Ivan Drago - who Rocky just barely tops - we find a post-bout Stallion as he experiences uncontrollable trembling. Uh-oh - something’s wrong with the Rock! This isn’t the first time that the character has experienced serious health concerns; in Rocky II, he was told not to box or he’d likely lose his sight. That problem was quickly overlooked in later installments, but Rocky’s brain damage plays a more significant role here. For one, it keeps him out of the ring - really - and it also may have been responsible for Stallone’s most mannered portrayal of the character. I watched four of the five Rocky films over a two-day period, and it was fascinating to see the different ways Stallone took on the part. I saw him slowly leave the original stumblebum nature of Rocky through the second movie until Balboa seemed completely unrecognizable by Rocky III. With Rocky IV, Stallone made baby steps toward the original nature of the role, and outwardly, he seems completely back in the fold with the fifth film. However, that’s not really the case, as it’s clear Stallone lost any acting ability he once possessed between the 1976 original and the 1990 fifth installment. As such, his final attempt at Rocky is all about mannerisms and that goofy voice; it lacks any form of humanity or passion. Well, at least he wasn’t the robotic figure seen in Rocky III. RV’s Stallion is pathetically comic, but that’s closer to the real character than we’d seen in a while, so I’ll take it. Anyway, concurrent with the discovery of Rocky’s brain damage, he becomes bankrupt. A silly plot device accomplishes this, and it’s clear that events take this turn for the worse simply because it’s the most expedient way to take the clan back to their roots. 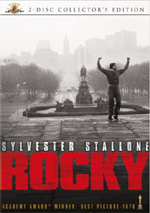 Rocky’s palatial estate housed himself, wife Adrian (Talia Shire), brother-in-law Paulie (Burt Young), and son Rocky Jr. (played by Sly’s real son Sage Stallone). Little Rocky provides one of the movie’s most glaring continuity problems, as he ages a bunch between flicks even though he should remain the same. Since I watched RIV and RV back to back, I saw quite a few of these. For instance, Shire’s hair grew inches and looked completely different, even though she should have presented the same appearance as in the 1985 flick. Nonetheless, the concerns related to Rocky’s son are the most problematic. As I already noted, the initial events of Rocky V take place soon after the conclusion of Rocky IV. During the latter film, little Rocky was about six years old; the preceding movies hadn’t been all that strict about their continuity, but at least he’d seemed to age normally during that span and other events passed before we got a look at the older version of the character. That doesn’t happen in RV. Instead, we meet little Rocky as soon as his parents disembark from their trip to Russia. As such, the boy ages many years in the space of one evening! When they left, he was six, but now he’s about 13! (Rocky Jr.’s age is never discussed, but Sage was 14 when the film was shot, and his cohorts seem to be around 12 or 13.) This makes absolutely no sense except for the fact it works for the script. That’s because the movie requires Rocky to become moderately estranged from his son, and a younger kid would misplay the little guy’s angst and rebellion. Also, I’m sure Stallone wanted to include his own son, and that meant that little Rocky had to age a bit. Anyway, after Rocky loses his fortune, he conveniently returns to the old neighborhood and he reopens Mickey’s gym. While there he meets young fighter Tommy “Machine” Gunn (Tommy Morrison), a rough-hewn Okie out to follow in the Rock’s footsteps. Initially Rocky resists Tommy’s entreaties to train him, but he eventually gives in and helps make the youngster into a virtual clone of himself. Along the way, Rocky becomes much more involved with Tommy’s life than with his son’s, which leads to that aforementioned estrangement. Eventually, Tommy is seduced by the money and babes offered by Don King clone George Washington Duke (Richard Gant) and he turns his back on Rocky. Of course, this means that in due time, the two of them will go at each other; you get no prize for predicting the winner. While I didn’t much care for Rocky V, I will give the filmmakers credit for their attempt to diverge from the path seen in the prior two sequels. Those went with exceedingly cartoonish depictions of our characters’ worlds, and they became little more than big, broad comic books. At least RV tries to exist in the real world. Unfortunately, it suffers because it so strongly compares itself to the original film. The first Rocky was a once-in-a-lifetime special piece of work that doesn’t come around twice; the folks behind it got lucky and were never really able to recapture anything similar. Hey, I can’t blame them for trying, but I also can’t say I’m surprised that they fail. Rocky V usually falls flat because it attempts too stridently to emulate the first movie. The same sights and sounds reappear, and they all feel forced and artificial. Of course, the film has a different tone due to the path the relationship between Rocky and Tommy takes, but that aspect was problematic as well. While I can see someone like Tommy turning his back on Rocky, it all happened much too quickly and easily; the movie simply needed a violent bad guy, and Tommy was the most convenient party. It didn’t help that our newest boxer really couldn’t act. Morrison was an actual fighter of modest repute who made his one and only screen performance here. Actually, he’s not terrible as Tommy, which isn’t surprising since he’s essentially playing himself. Still, he appears awkward and phony for the most part, and his incessant prefacing of almost all lines with the word “man” became strangely amusing; turn that into a drinking game if you ever want to get totally trashed. At least Morrison brought his boxing scenes to life, which also made sense. Most of the other actors offer less excitement. As Duke, Gant seems too “spot-on”; the obvious emulation of King becomes silly and tiresome quickly, and it adds nothing to the film. Young and Shire continue their non-existence as characters who exist inside the frame but have almost nothing to do. As I’ve said during my reviews of the last two sequels, they appear in the movie simply because they’re supposed to be there; otherwise they have no reason to exist. To my modest surprise, Sage Stallone isn’t bad as Rocky’s son. Granted, some parts of the role weren’t much of a stretch, but little Rocky actually has to go through the greatest arc of any character here. While Sage’s performance tends to be a bit too whiny and petulant, he still seemed acceptably convincing in the part. It’s not a killer piece of work, but it certainly stood out positively compared to other famous-child acting from 1990. At least no one attacked Sage as they did Sofia Coppola for her performance in The Godfather Part III, another failed sequel from that year. How odd that Shire appeared in both films! After steady returns for all of the prior four Rocky movies, Rocky V tanked at the box office, which is probably why we have yet to see a sixth installment. I think this drop-off more greatly reflected Stallone’s decline than it did the quality of the film itself. To be certain, RV is a flawed movie, and on its own, it’s not much of a special piece of work. However, I thought it was probably the best of the four sequels, so its failure certainly wasn’t because it was worse than its predecessors. Ultimately, Rocky V was a mildly watchable but forced and unspectacular movie. 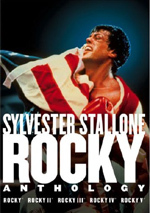 Rocky V appears in both an aspect ratio of approximately 1.85:1 and in a fullscreen version on this double-sided, single-layered DVD; the widescreen image has been enhanced for 16X9 televisions. Only the latter was screened for this review. Although the picture offered a few minor problems, as a whole it looked quite solid. Sharpness seemed consistently positive. A small amount of softness interfered with some wider shots, but these concerns were quite minor. As a whole, the movie appeared crisp and detailed. Moiré effects and jagged edges presented no problems, and print flaws essentially remained absent. Note that although a few scenes - mostly flashbacks that involved Mickey - displayed intentional grain, I didn’t factor that in as a negative. For the most part, the movie lacked grain, though one quick scene provided a definite exception. At 59:58, the camera zooms in on Rocky Jr., and the image seemed bizarrely grainy. There was no sign of this concern before or after this short shot, so I don’t know what happened. It was a brief moment, but it stood out to me. Colors appeared quite accurate and vivid, as they provided the nicest hues to be found in any of the Rocky movies. The palette largely remained subdued, but the film replicated the various colors with solid and distinct tones that seemed very pleasing. Black levels also appeared deep and rich, and shadow detail was consistently clean and appropriately opaque. This was a fine transfer that merited a “B+”. Also positive was the Dolby Digital 5.1 soundtrack of Rocky V. The soundfield offered a general bias toward the forward channels, where I witnessed good delineation across the speakers. A fair amount of unique effects could be detected in all three channels, and the sounds blended together nicely. Music showed good stereo separation as well, and the forward spectrum appeared fairly lively and involving. Surround usage was a little more subdued, but the rears played a positive role when appropriate. They gave us good reinforcement of both music and effects, and they jumped to life neatly on occasion. For example, scenes in which trains rolled by seemed quite effective, and the surrounds offered a solid echo on those occasions. Ultimately, the soundfield wasn’t special by today’s standards but it appeared quite solid for the era. Also fairly good was the audio quality. Speech suffered the most concerns, though they remained modest. While dialogue generally appeared acceptably distinct and accurate, some lines sounded rather edgy and brittle. However, intelligibility was never a concern. Effects also could be a bit thin, but they usually came across as fairly clear and realistic, and they displayed no problems related to distortion. Music fared best of the bunch, especially when the mix provided pop songs. Those sounded clean and wonderfully deep, as the movie featured some nice bass. In the end, the soundtrack for Rocky V showed its age but it still worked better than the audio for any of the preceding four movies and it earned a solid “B+”. Less satisfying are the DVD’s extras. All we find on this disc is the film’s theatrical trailer. Weak! Although its poor box office performance seems to have killed the franchise, 1990’s Rocky V is far from the worst of the first four sequels. In fact, I think it’s probably the best of that bunch, though that’s a pretty lackluster endorsement. RV is a flawed film that has many problems, but at least it attempted to return to the spirit and tone of the original, and it becomes more interesting due to those factors. The DVD offers very good picture and sound of the five films, though it continues to skimp on extras. Ultimately, Rocky V is a decent piece of work, but as with the other sequels, it probably will remain most interesting for devoted fans of the series; less interested parties will likely not find a lot to compel them.